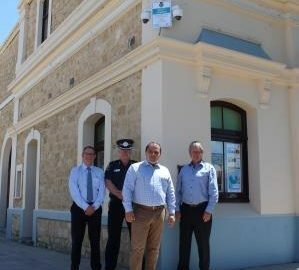 Member for Barker Tony Pasin has delivered on a $160,700 promise for increased CCTV cameras in Murray Bridge with a network of 32 cameras in 14 locations now operational across the rural city. Mr Pasin said the project received funding from the Federal Government’s Safer Communities Program. “Our Government is committed to keep Australians safe and secure by enhancing the efforts of local councils and community organisations to address crime and antisocial behaviour,” Mr Pasin said. Australia wide the Federal Government has delivered over $130 million in crime prevention projects, to assist local Councils and communities in tackling crime and anti-social behaviour. “By empowering local organisations and councils to improve their security infrastructure, addressing crime and anti-social behaviour, the initiative increases perceptions of safety and cohesion, fostering viable and vibrant communities into the future. That’s what we want here in Murray Bridge.” Mr Pasin said. Mr Pasin said the camera system in Murray Bridge was already paying dividends with camera footage leading to at least one arrest since the cameras have been fully operational since late December. “I promised to deliver this funding to make Murray Bridge safer and I’m really pleased see the project now complete and already delivering outcomes for the community,” Mr Pasin said. The Rural City of Murray Bridge Mayor Brenton Lewis, said “the Council greatly appreciated this much needed funding through the Federal Government’s Safer Communities Program which has enabled Council to roll out 32 new CCTV cameras across 6 existing locations and an additional 8 locations across the Rural City of Murray Bridge.